Is Fiat Chrysler Automobiles NV (NYSE:FCAU) a bargain? Prominent investors are turning bullish. The number of long hedge fund bets increased by 1 in recent months. Our calculations also showed that FCAU isn’t among the 30 most popular stocks among hedge funds. To most stock holders, hedge funds are seen as unimportant, outdated financial tools of the past. While there are more than 8000 funds with their doors open today, We hone in on the elite of this group, approximately 750 funds. These money managers administer bulk of the hedge fund industry’s total asset base, and by tracking their matchless equity investments, Insider Monkey has come up with several investment strategies that have historically exceeded Mr. Market. Insider Monkey’s flagship hedge fund strategy defeated the S&P 500 index by nearly 5 percentage points annually since its inception in May 2014 through early November 2018. We were able to generate large returns even by identifying short candidates. Our portfolio of short stocks lost 27.5% since February 2017 (through March 12th) even though the market was up nearly 25% during the same period. We just shared a list of 6 short targets in our latest quarterly update and they are already down an average of 6% in less than a month. We’re going to take a look at the new hedge fund action encompassing Fiat Chrysler Automobiles NV (NYSE:FCAU). What have hedge funds been doing with Fiat Chrysler Automobiles NV (NYSE:FCAU)? At Q4’s end, a total of 34 of the hedge funds tracked by Insider Monkey held long positions in this stock, a change of 3% from one quarter earlier. 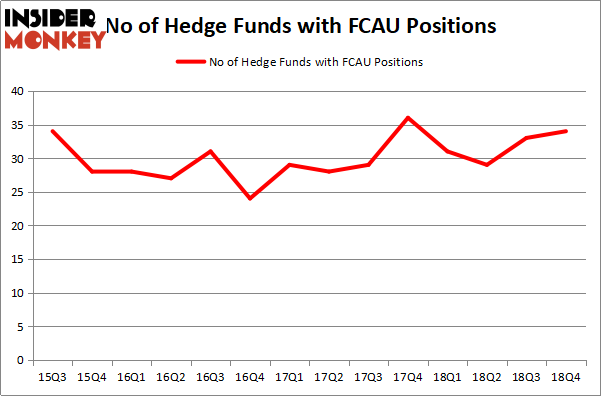 On the other hand, there were a total of 31 hedge funds with a bullish position in FCAU a year ago. So, let’s examine which hedge funds were among the top holders of the stock and which hedge funds were making big moves. Of the funds tracked by Insider Monkey, Tiger Global Management LLC, managed by Chase Coleman, holds the number one position in Fiat Chrysler Automobiles NV (NYSE:FCAU). Tiger Global Management LLC has a $1.1719 billion position in the stock, comprising 7.8% of its 13F portfolio. The second largest stake is held by AQR Capital Management, led by Cliff Asness, holding a $240.6 million position; the fund has 0.3% of its 13F portfolio invested in the stock. 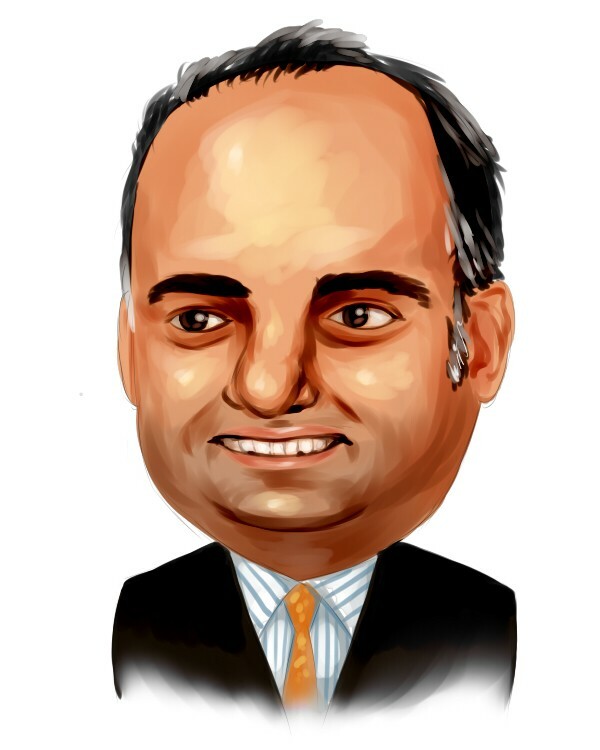 Some other hedge funds and institutional investors that are bullish comprise Mohnish Pabrai’s Mohnish Pabrai, and Peter Rathjens, Bruce Clarke and John Campbell’s Arrowstreet Capital. As industrywide interest jumped, specific money managers were breaking ground themselves. StackLine Partners, managed by Brian Gootzeit and Andrew Frank, established the most outsized position in Fiat Chrysler Automobiles NV (NYSE:FCAU). StackLine Partners had $6 million invested in the company at the end of the quarter. Richard Rubin’s Hawkeye Capital also initiated a $4.3 million position during the quarter. The other funds with new positions in the stock are Gregory Bylinsky and Jefferson Gramm’s Bandera Partners, Ken Heebner’s Capital Growth Management, and Minhua Zhang’s Weld Capital Management. Let’s check out hedge fund activity in other stocks similar to Fiat Chrysler Automobiles NV (NYSE:FCAU). These stocks are V.F. Corporation (NYSE:VFC), Autodesk, Inc. (NASDAQ:ADSK), Manulife Financial Corporation (NYSE:MFC), and Chunghwa Telecom Co., Ltd (NYSE:CHT). This group of stocks’ market valuations resemble FCAU’s market valuation. As you can see these stocks had an average of 27 hedge funds with bullish positions and the average amount invested in these stocks was $1066 million. That figure was $2241 million in FCAU’s case. Autodesk, Inc. (NASDAQ:ADSK) is the most popular stock in this table. On the other hand Chunghwa Telecom Co., Ltd (NYSE:CHT) is the least popular one with only 2 bullish hedge fund positions. Fiat Chrysler Automobiles NV (NYSE:FCAU) is not the most popular stock in this group but hedge fund interest is still above average. This is a slightly positive signal but we’d rather spend our time researching stocks that hedge funds are piling on. Our calculations showed that top 15 most popular stocks among hedge funds returned 19.7% through March 15th and outperformed the S&P 500 ETF (SPY) by 6.6 percentage points. Unfortunately FCAU wasn’t in this group. Hedge funds that bet on FCAU were disappointed as the stock lost 0.8% and underperformed the market. If you are interested in investing in large cap stocks, you should check out the top 15 hedge fund stocks as 13 of these outperformed the market.